NYC streetwear brand and serial collaborator Supreme officially announced on Monday that its next collaboration, due for launch this spring, is with Irvine, California-based motocross and extreme sports lifestyle brand Fox Racing. The collection includes a moto jersey top, a moto pant, a Proframe roost deflector vest, bomber LT gloves, Vue goggles and a moto hand grip, all featuring Supreme and Fox Racing branding. The deflector vest has a removable back panel and an integrated buckle system, and is compatible with neck supports. An exclusive V2 helmet with a fiberglass shell and a dual density EPS liner will also be available. The helmet meets EVE 22.05 and DOT certifications, and features a ventilation system that incorporates ten intake and four exhaust vents. All of the pieces are available in three colorways: blue and neon yellow, classic Supreme red and white, and black and white. Fox Racing was founded as Moto-X Fox in Campbell, California by Geoff Fox in 1974 and started out as a European bike parts distributer before starting to manufacture its own pieces. Later, when Moto-X Fox’s professional motocross team came together, Geoff Fox handmade their colorful uniforms, which fans soon began requesting at the brand’s Campbell store. Fox Racing is now a globally recognized motocross brand best known for its vibrant racewear, a fact reflected in the Supreme collection’s impactful color palette. 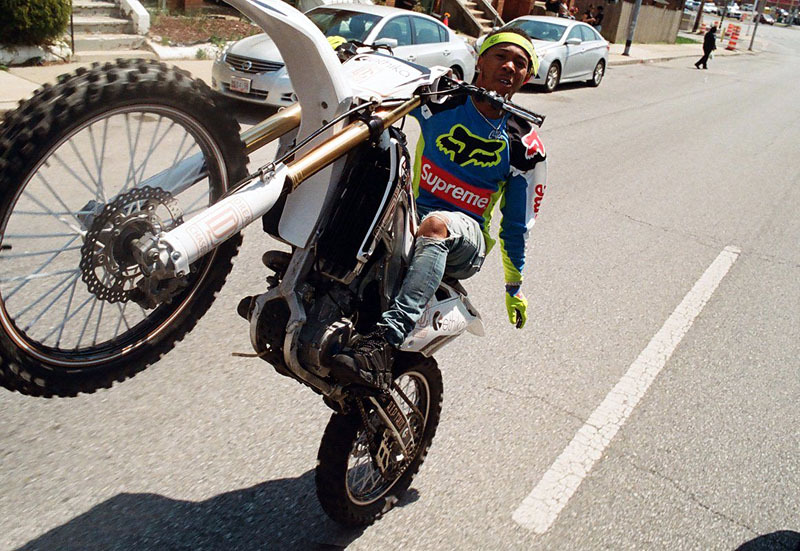 After leaking last week, the collaboration was teased on Supreme’s Instagram account over the weekend with a video featuring Dreamchasers rapper Chino riding a motocross bike around the streets and doing tricks. The Supreme x Fox Racing collection launches in Supreme stores in New York, Brooklyn, LA, London and Paris, as well as online, on May 10, and will be available in Japan from May 12.